Louis Mahe is a tobacco planter at Reunion Island. He is waiting for Julie Roussel to marry her. He only knows her by mail. The woman that comes does not like the picture he got, but he marries her anyway. Though most might consider the two an ideal combination, love and marriage don't always come together naturally. At least, not at first… especially if the bride and groom in question happen to be complete strangers… and one of them just might be a killer. Such is the case in Francois Truffaut's darkly romantic noir, 'Mississippi Mermaid.' A Hitchcockian thriller marked by deep emotion, the film weaves a dangerous tale of passion that wavers between idyllic and unsettling -- chronicling a relationship that will either blossom or lead its lovers to their graves. Based on the 1947 novel "Waltz into Darkness" written by Cornell Woolrich, the story follows Louis (Jean-Paul Belmondo), a wealthy but lonely tobacco factory owner who lives on the French island of Reunion. After corresponding with a woman named Julie (Catherine Deneuve) through the personals section in a newspaper, Louis decides to wed the mail-order bride. But when Julie finally arrives, she gradually reveals herself to be much more than she first appears. As potentially dangerous secrets are exposed, Louis will have to decide whether this burgeoning romance is worth risking his life for. Taking inspiration from the decidedly differing works of Alfred Hitchcock and Jean Renoir, the movie carefully balances twisting suspense with emotional depth, crafting an engaging mystery that gives way to a complex and perilous love story. To this end, we start out knowing the characters much like they know each other -- as strangers, and as the runtime evolves we watch as their relationship develops into something real. Or does it? After all, the truth behind Julie's motivation becomes the film's ultimate mystery, and Truffaut does a great job of pacing the narrative while blending scenes of palpable intrigue with more idyllic stretches of blissful courtship, maintaining interest both before and after the potential femme fatale's real nature is revealed. 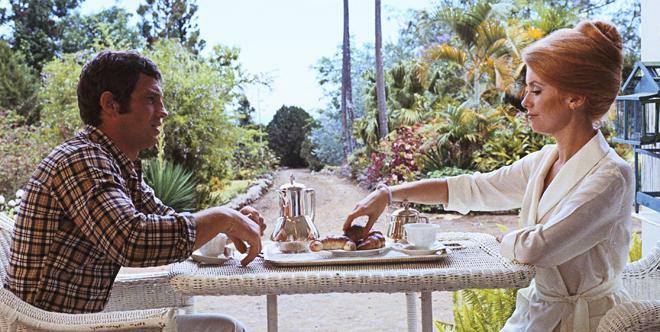 At the center of all this intrigue rests the newly-wed couple in question, and legendary French movie stars Jean-Paul Belmondo and Catherine Deneuve make for a truly engaging pair. At first, the married strangers evoke an appropriately awkward and distant union, but as their relationship progresses, the two ultimately sizzle on screen together with sensual, dangerous, and at times, even rather playful chemistry. This gradual emotional growth (with some very notable ups and downs along the way) is likely heightened by the director's decision to shoot the film almost entirely in sequence, allowing the actors' own building familiarity to mirror their characters'. For his part, Belmondo brings an effective level of somber determination and obsessive romanticism to his love-stricken protagonist. In contrast, Deneuve actually becomes the stronger of the two, using her striking beauty to control and manipulate others while hiding layers of ambiguous emotion… from the audience, Louis, and perhaps, even herself. Infusing the proceedings with a few trademark splashes of French New Wave style, director Francois Truffaut crafts a stimulating aesthetic that uses its more overt flourishes in moderation. Long takes with slowly reframing shots help to gradually draw out the story's sense of suspense, while more formalistic techniques like freeze frames and jump cuts help to manipulate the pace even further. One particularly effective scene features Louis frantically driving to a specific location while we simultaneously hear the troubling conversation he will have at his destination before he actually arrives -- ramping up the rhythm considerably. With that said, there are a few old-school thriller techniques that feel a bit too on the nose, including symbolic foreshadowing that involves a record and a lingering camera move that not so subtly punctuates on an object of suspicion. But to Truffaut's credit, the majority of the runtime is quite absorbing, and the director even manages to make an extended exposition scene visually interesting thanks to his slinking camera movements. Through its perilous examination of romance, 'Mississippi Mermaid' becomes a quietly riveting film about the joys and pain of love. As a French New Wave spin on classic Hitchcock tropes and Renoir drama, the movie manages to pay homage while simultaneously evolving into something entirely unique. Though this may not be one of Francois Truffaut's most popular or celebrated efforts, it remains a strong entry in his storied filmography, weaving an intriguing tale of murder and matrimony. 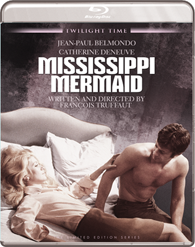 Twilight Time brings 'Mississippi Mermaid' to Blu-ray on a single BD-50 disc that comes housed in a keepcase. Like most of the company's releases, the disc is a limited edition with a run of 3,000 copies. An insert with an essay by Julie Kirgo is included as well. The movie is provided with a 1080p/AVC MPEG-4 transfer in the 2.35:1 aspect ratio. Uneven and a tad rough at times, this is a decent yet unremarkable image. The source print is in OK shape with a slightly fuzzy layer of grain retained throughout. With that said, there are periodic signs of moderate damage, including faint pulsing, scratches, tears, and specks. Likewise, a few shots here and there have a rougher appearance, and the opening scene is particularly problematic with more pronounced wear. The overall picture has a predominantly soft quality with a flat sense of depth that occasionally lacks the level of detail one usually associates with HD transfers. Thankfully, some scenes (like a fireplace conversation and a few close-ups) exhibit stronger signs of fine texture and dimension. Colors mostly adhere to a faintly dull palette of pastel hues, but there are bolder splashes here and there (a red car, for instance). Contrast is maintained well with even whites and consistent black levels. Underwhelming but free from any major signs of digital manipulation, the image manages to get the job done -- even if one can't help but think that a new master and restoration could yield much better results. The film is presented with a French DTS-HD MA 1.0 mono track along with hardcoded English subtitles. Modest yet fitting, the mix works well with the content. Dialogue is clear throughout with no major balance issues. The overall track has a comparatively flat quality, but the single channel of audio is free from notable signs of crackle, hissing, or pop. Though the soundstage is relatively restrained, there is some decent atmosphere (particularly in the island scenes) and Marcel Berbert's score comes through with solid, albeit occasionally strained, fidelity. About on par with similar mono tracks of this time period, 'Mississippi Mermaid' hits Blu-ray with a solid mix. Isolated Score Track – When this track is toggled, audiences can watch the film with Marcel Berbert's isolated musical score in DTS-HD MA 2.0. Commentary by Film Historians Julie Kirgo and Nick Redman – The duo discuss the movie's themes, locations, cast, style, and place within Truffaut's filmography. Though the pair can focus a bit too much on plot/character summary and analysis for my tastes, this is an informative track with some solid insights. Original Theatrical Trailer (SD, 3 min) – The film's theatrical trailer is included in standard definition with DTA-HD MA 2.0 sound. MGM 90th Anniversary Trailer (HD, 2 min) – Presented in 1080p with DTS-HD MA 5.1 sound, this is a sizzle reel with clips from MGM films in celebration of the studio's 90th Anniversary. Francois Truffaut's 'Mississippi Mermaid' is a quietly absorbing noir drama steeped in dark romance and French New Wave style. On the technical front, this limited edition disc features a fairly underwhelming but serviceable transfer, and a solid audio mix. Though not packed with supplements, the included commentary has some decent insights. This isn't the most impressive disc, but fans of the director and other Hitchcock-influenced films will definitely want to check this out. Worth a look.